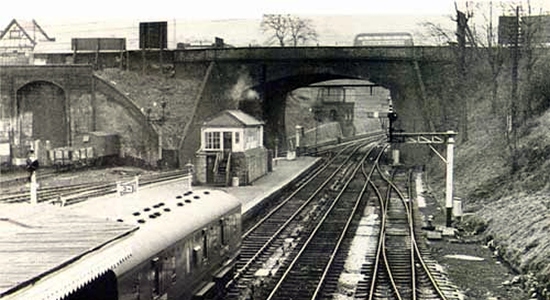 Above we see Dudley Station in 1956 looking towards Blowers Green through the bridge carrying the A459(photo: Dudley Library). This station is another railway centre that holds fond childhood memories for me was Dudley - the hours I must have spent looking out of the window of Dudley Zoo cafe at the goings on in the then Freightliner yard on trips with my mother to look at the animals! Dudley station opened in 1860 and was at the intersection of lines by the Oxford, Wolverhampton and Worcester Railway and the South Staffordshire Railway: later incorporated into the GWR and LNWR (itself later abosorbed into the LMS), respectively. Above-left we see virtually the same view as the main photo at the top of the page. Nature's reclamation of the site is almost total in some areas. 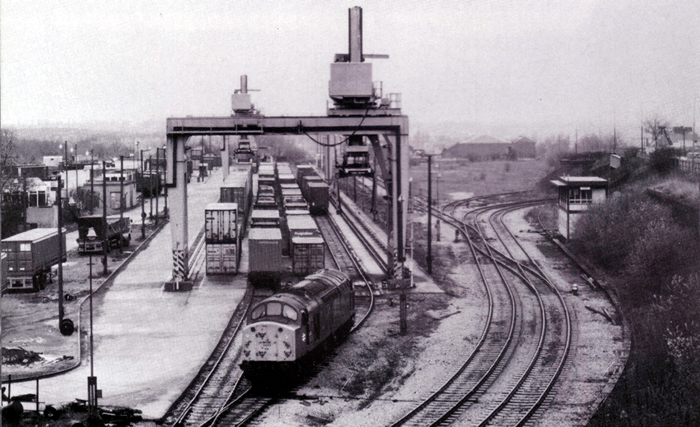 The station was divided into a LMS side and a GWR side, this view is taken on the LMS side, the GWR being to the right: the line on the right ends just under the bridge but the left-hand line continues. 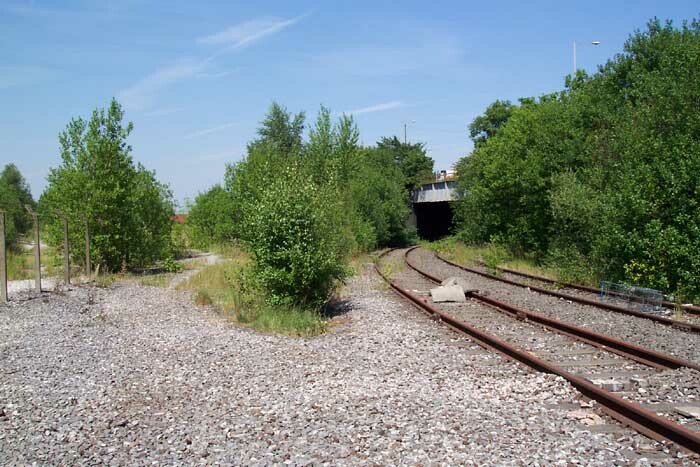 Above-right is the view across the remaining lines to the LMS station site, the entrance to the GWR side of the station was roughly where the photographer is standing - the bridge in the above-left picture being to the right of the shot. 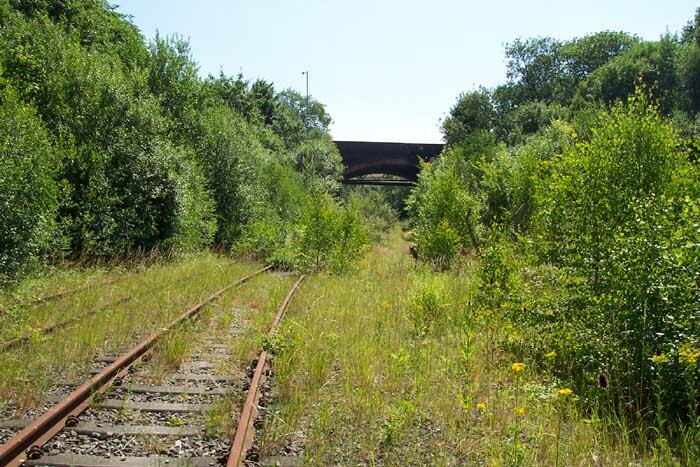 Above-left we see the site with our back to the road overbridge watching the double-track remaining lines curving away towards Dudley Port Low Level. To the left is the site of the Freightliner terminal which is now just an overgrown field. It would appear that the lines are nowadays unused (unless someone can tell me different) - certainly the line on the left of the picture would seem defunct as it finishes just behind the photographer - no buffer stops, just ends. However, it has been mooted that these lines may be used for a proposed Metro service but funding has yet to be secured. Above-right we see the site as the Freightliner terminal in the early-1980s (photo: Brian Robbins) - the lines in the previous photo can clearly be seen here running along the right-side of the image.